I've got to give some credit to Nicki Minaj for some awesome lyrics in her song Moment for Life "...No I'm not lucky, I'm blessed, yes!" I think she hits the nail on the head with that one. I am blessed. I worked 41 hours this week. It would have been more but I left work at 2:30 on Friday to drive up to Fairmont, MN to see my family and run a race Saturday morning. Work has picked up in our group and I've been busy working on several different projects. When I was in school, waking up at 7 was about all I could muster, and some days even that didn't happen. When I was unemployed, after the first month waking up at 8 or 9 was about all that ever happened. (The first month I still thought I was awesome.) Now, I'm waking up before 6 a few times a week to go running and I'm getting to work a few times per week before 7. The way I see it, I must be excited to go to work if I'm waking up that early to go. I feel the fact that I am waking up and going to work that early as of the biggest factors of my job satisfaction. In other words, work is going well. I ran only 66 miles this week, but I had a race where I set a personal record in the 5 mile (27:39) and I had a 5x1000 meter workout that was easily the best 5x1000 meter workout I have ever had (total time for the 5000m was 16:04 with 400m jog rests at 1:45-50 in 90F heat). I'm not where I want to be this fall, but this is an extremely good introduction stage for my training. Thus far this year I have set person records at 4 miles, 5 miles, the half marathon, and marathon. I'm aiming for a 5k PR with my training right now, and later in the fall I will target the half and in the early winter I will target another marathon. I'm still plenty far away from my career running goals, but I'm progressing, and that is far better than regressing. It is looking more likely that I will get an assistant coaching job and I am excited. I enjoy the team aspect of running and I have learned so much about running the past ten years that I look forward to sharing my knowledge and experience with younger runners so that they might not make the mistakes that I have made. I figure that because of the way that I have trained, or rather more appropriately neglected to train, the last ten years I am probably 3-4 years behind in my development as a runner. Which would be a problem if I was focused on the shorter distances and only my own personal running career, but seeing as how marathoners regularly peak in their mid 30s and I am interested in coaching, I think that my self-imposed and unintentional setbacks will serve me to help a greater number of young athletes and to do more appropriate training both for myself and for athletes I work with. What else happened this week? I played cards and had a fire at a friend's house and I regaled them with tales of Pakistan and unemployment. One of the nice things about getting older is that I have a greater repertoire of stories to tell. On the negative side, another person died on Broad Peak. Two people I know were on the expedition with him. It is a struggle. I love the mountains and climbing, but people dying? It scares me because I am fairly sure that at some point I will be in a situation that is extremely personal regarding death on a mountain. The other thing that I did this week, slightly out of the ordinary, was listen to a huge amount of NPR (because they have a free iPhone app). I am not a political person. I have trouble spelling politics half the time. I guess that as I get older and listen to authority figures and talk with them, I keep coming to the conclusion that we are all so equal. That is to say, there is no person who is so brilliant that will fix all of our problems, specifically the US budget problems. In science and engineering we often break problems down into sizes that one person, or perhaps two, can solve. The budget and deficit deal in Washington is so massive, that to really solve it long term will take hundreds, and more likely thousands of people. Even with all of that brain power at work, they are still not going to make it better. It is never more fun to pay off your debt than to run up your debt. It is interesting to note that our Federal Debt as a percentage of GDP rises and falls irrespective of party lines. I feel that is significant because it means that neither party is free from blame when it comes to our Federal Debt. 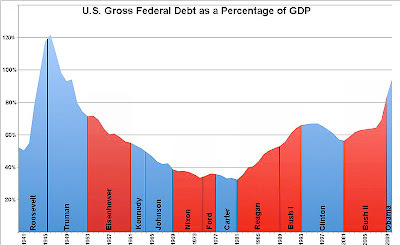 Interesting to note, I thought that the 1980s enjoyed a great economy, why then did we raise the amount of debt so much instead of paying it off? Please educate me by commenting. GDP is misleading in general, because it simply reflects how money is spent. More important is GDI (gross domestic income) which is how the money is earned in the first place. Actually, both parties are to blame for the debt, because one side won't cut a cent out of warfare, and the other side won't cut a cent of entitlements. The country is bankrupt, the Fed prints money to tide us over through paying interest on the debt and to send the checks out, but the dollar is worth less and less every day. The real default(hyperinflation of the dollar) is coming and it is unavoidable. You'll know when it hits when all those dollars in your wallet won't buy you anything. I will not argue with what you said, the future can sure be scary.